Some of your fellow PV Democrats members are joining forces with other grass roots organizations under the guidance of Indivisible South Bay Los Angeles to man phone banks to flip local Republican House Seats. 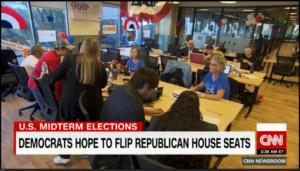 Click on the CNN image on the right to see the CNN story about the effort to flip 4 Republican House Seats in our own backyard. 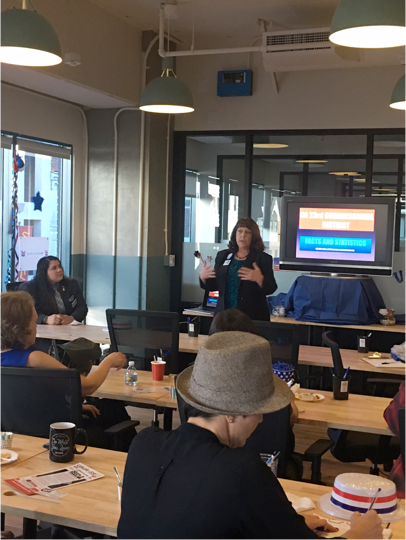 That effort recently included a Meet & Greet with WENDY REED of CA CD23 in January. Wendy is a leading Democratic Candidate with a very good chance to unseat Kevin McCarthy, the republican house majority leader!! What I like about her personally and all who have heard her speaking and who know her is the fact that she’s honest, transparent, smart, passionate, relentless and frugal!! She does NOT accept corporations and superPAC funding. All grassroots. If you recalled in 2016, she won almost 31% votes, apprx. 75,000 votes from Dems, Independent and even repubs. voters. While her opponent spent almost $5,000,000. Please visit her website for more information about her and her issues, http://wendyreedforcongress.com/. BTW, I have several more those Underdog Candidates coming up.